Slow Food Norwich are pleased to be holding a tasting of four organic and biodynamic olive oils from Italy at the Virgin Money Group in Norwich on March 14th. These rare artisan produced extra virgin olive oils are from three different regions of Italy, Umbria, Le Marche and Tuscany, and the producers all subscribe to the Slow Food ethos of good traditional, regional and local cuisine. The oils that are to be tasted are all produced either by organic or biodynamic methods of production, and Slow Food Norwich is committed to the promotion of these types of oils and the small artisan producers who still make olive oil using the traditional methods and in a lot of cases using rare varieties of olives. Slow Food Norwich supports and promotes local Norfolk producers but as part of Slow Food International we are also pleased to be able to offer our members and a wider public in the Norfolk produce from other parts of the world where Slow Food operates. We find that fine organic and biodyanmic olive oils are increasingly popular with consumers and we have set out to bring only the best artisan Italian extra virgin olive oils that we can find to try at Virgin in Norwich this March. 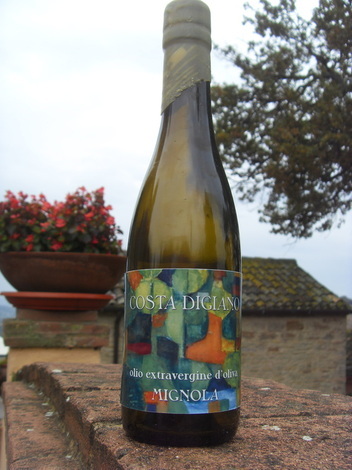 We have several organic olive oils from central Italy and one from near the beautiful city of Todi in Umbria, El Mansur is produced at the estate now owned by Matteo Boetti, but set up by his father Alighiero Boetti who was one of the foremost Italian artists of the 20th century. Matteo has only started producing this oil fro sale to the public this year and it is a really fine delicate olive oil. Lastly we will be tasting an olive oil from Tuscany which is made at Azienda La Torre at their beautiful estate and agriturismo just outside the famous Tuscan town of Arezzo. This organic olive oil is one of the best oils that we have tasted and we are really pleased that we can have this at the tasting in Norwich.